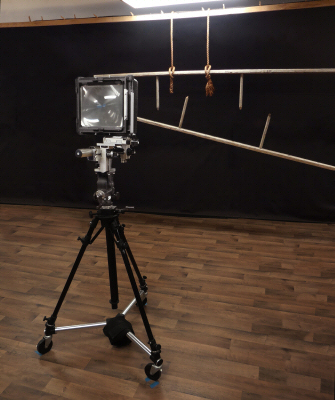 In order to capture the maximum amount of visual information and detail, Althouse utilizes large format view cameras with film rather than digital cameras. Most of his images created after 2004 are made with 8x10 and 5x7 inch black and white sheet film, and images created in Belgium 2003-2004 were made on 4x5 inch black and white sheet film. Using only available light and time-exposures up to 8 minutes, Althouse overexposes the film in the camera to insure the capture of all shadow detail in his darker subject matter. This is combined with special underdevelopment of the film with a high acutance film developer solution in order to conserve highlight details such as in his bright white cloth. Althouse scans his processed sheet film negatives in order to digitize his images to the computer. Using imaging software he subtly manipulates and enhances each of his images in preparation for printing. He prints his images to a very large scale, up to 9.5 feet in length, using a wide format inkjet printer with highly stable pigmented inks on acid free cotton rag paper. Applying his darkroom printing skills to his digital printing techniques, Althouse is able to produce archival pigment prints of superlative richness, tonal quality, and detail. Occasionally Althouse eliminates film and camera in his process by placing his subject matter directly upon the scanner bed. With the scanner acting as a camera, an image of the object is digitized to the computer. It is then is then manipulated, sometimes combined with other objects, and similarly prepared for digital printing as with other pieces. Some examples illustrating Althouse’s use of the scanner as camera are Hammer with Braille, Axe and Tapestry, Belgian Ribbon, and Adjustable Wrench. Most of the images in the Shrouds series were made on coarser grained medium format 6x7cm black and white negative roll film. 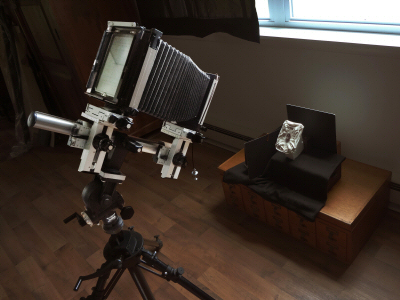 Using studio strobe lights for illumination, Althouse shot his assembled objects with a 4x5 view camera equipped with a medium format roll film magazine. For this series he used an alternative black and white darkroom printing technique utilizing a rare point light source enlarging system. This unusual enlarging system required extremely dense low contrast negatives, so Althouse abnormally overexposed and underdeveloped his film using a high acutance film developer solution. Through experimentation with the point light source enlarging system for the Shrouds series, Althouse created large-scale silver gelatin darkroom prints. His prints have a unique characteristic of being exceptionally sharp even at great magnification, a precursor to his current large scale digital printing. By employing dense and coarse grained negatives for much of this series, the images have a sand-like quality at close examination yet they retain a hyper sharpness that is uncharacteristic of large prints. Using an elevated wall-mounted enlarger with a special point light source head to accentuate sharpness and grain, Althouse projected the negative image onto large fiber based black and white paper rolled out on the floor. The paper was developed in oversized fiberglass trays using modified black and white chemicals. While esteeming fine silver printing, Althouse began experimenting with digital printing during the late 1990’s as the scale of his work increased beyond the practical possibilities of the darkroom. Technical exceptions to the Shrouds series are The Five Talents, Dart, Twisted Shroud, Chartres, and Knot I which are examples of some of his first digital experiments. With scanner as camera as described above, his subjects (cloth) were placed directly on the scanner bed. Althouse also was experimenting at this time to achieve permanent high quality inkjet prints by converting available dye-based inkjet printers to use third-party black and gray pigmented inks. Most earlier rectangular images are made on slow speed large format 4x5 inch black and white negative sheet film in a 4x5 view camera. 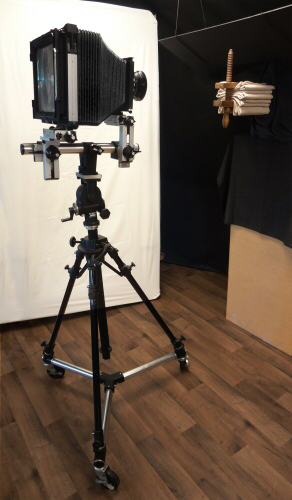 Square images are shot on slow speed 6x6cm black and white roll film using a medium format single lens reflex camera. Generally standard exposure and film processing was employed. Althouse’s silver gelatin prints were printed in the darkroom with an enlarger set up with a cold light diffusion light source. He used traditional black and white fiber based paper with standard processing methods. A silver gelatin print or silver print is the term for a darkroom (chemically processed) black and white photograph which is usually enlarged or contact-printed from a film negative. Althouse used bromide/chlorobromide heavy fiber based photographic paper which he carefully processed in a photographic darkroom for maximum print longevity. Sometimes referred to as pigment prints or archival pigment prints, both black and white and color, these prints are made with a digital inkjet printer using highly stable pigmented-based inks to provide exceptional longevity. For further stability and print quality Althouse prints onto heavy weight acid free cotton rag paper. Early inkjet printing with pigmented inks was limited in the late 1990’s through early 2000’s, however it is now a mainstream photographic process. A sepia toned print is a darkroom processed black and white silver gelatin print which has had additional chemical steps/toning process done in order to change the print’s neutral gray tones into warmer brownish tones. Hand coloring describes the manual placing of color onto a black and white photograph. Hand coloring was often used during the late 1800s and early 1900s to add color to black and white photographic prints prior to the invention of color film and color printing. The technique involves careful application of watercolor or oil paints to the surface of black and white prints, resulting in a unique color characteristic. Althouse uses two types of hand coloring techniques on some of his black and white images. In his earlier work he applies oil paints to the surfaces of the black and white prints. This is an exacting and time-consuming process, and in each case results in a unique one-of-a-kind print. In some of his more recent digitally printed work such as Belgian Shears and Belgian Ribbon, Althouse hand colors the black and white images using the computer. This also requires precision and a considerable investment of time though the finished hand colored digital image can be then printed digitally as a color print. Use of both traditional and digital hand coloring allows the artist to emphasize certain elements within his works.